Discussion in 'The Lounge' started by DirtyMike, Mar 22, 2010. 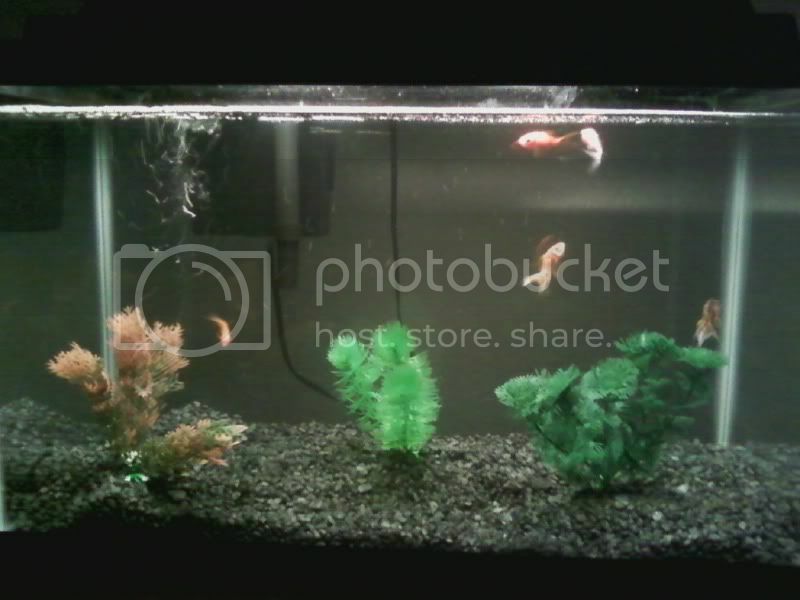 We decided to start off with cold water fish for now, easy desicion seeing how goldfish are soo cheap, and if we kill them it wont be sooo costly. Thinking about moving it to a tropical setup later, but we will see. Soooo, I have some questions for the fish guys here...... How hardy of a fish is the goldfish? Will they survive if I add the heater with them? 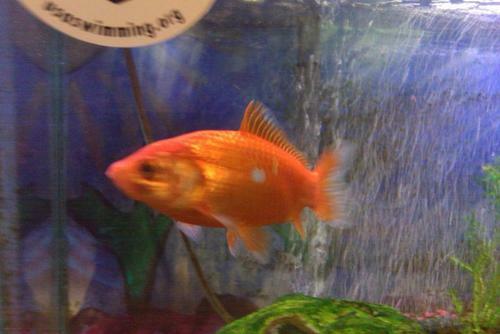 Or is that pretty much a death sentance for the goldfish? Another question..... Suggestions for possible cold water fish that get along well in a small tank like this? My wife like pretty stuff, thoughts and suggestions are welcome. Last question, Are live plants worthwhile in such a small tank? i dunno anything about fish so i'm no help. cool hobby tho, i should've thought of that before i got all invested in model rockets. i've always wanted like a five hundred gallon, salt water tropical setup. with an octopus. and while i'm at it, a bear. I have a couple of mates into saltwater tropical aquariums. Better than watching TV. 1. The heater should be fine, but get an adjustable one and start it at the lowest setting and increase it very slowly to the desired temp. I keep my tank at 77 degrees and I have a goldfish that has outlived 5 tropical fish. 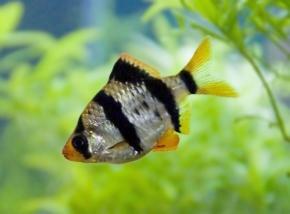 2.Buenos Aires and Tiger Barbs have done the best for me, but I'm sure anything fairly hardy should do fine with goldfish as long as you have a good filter. I think you would have to try and kill the goldfish. They are pretty easy. My brother is huge in to aquariums and had 4 or 5 at one point. 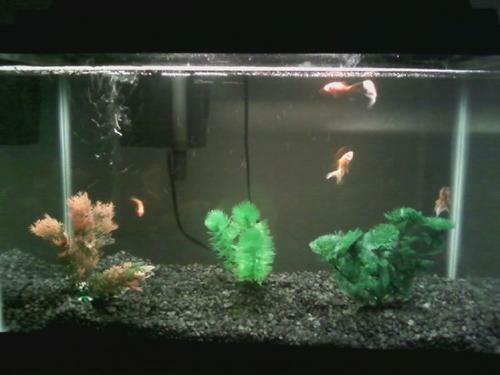 From what I understand, for freshwater, the smaller the tank is, the easier it is to take care of. For saltwater, the opposite is true, the larger tanks are easier, because the water isn't as prone to fluctuations in salinity and all the other factors. Fish are awesome to watch. We do the same thing...inexpensive goldfish and the like. Kids love them, easy to care for and grow like weeds. A fat blunt and a fish tank would probably lead to a enjoyable night. they look too small to eat....will they get bigger? i also read the dictionary. I thought you had other hobbies you were hooked on? A heater won't kill them, but putting them in an uncycled tank might. Do you know about the nitrogen cycle...or did you use some filter media from an existing tank? Might lose some of the fish you have, but goldfish are hardy. Bio-spira is a good product for cycling a tank immediately but its pricey. Tiger barbs and tetras would love to nip the fins off the fantails. Especially if you don't have a large enough school (they keep to themselves in a pecking order of sorts). Which might be kind of hard in a tank that small considering the goldfish will outgrow it as well (or have stunted growth). A pleco will do more bad than good. As you will have you feed it since the glass isn't covered in algae. Not to mention how much they crap and strain the bioload, and they will outgrow a 10g. My Tiger Barbs once ate a pleco... They never touched my goldfish though. But that may be because it's easily twice their size. I'd recommend getting a book about fish that describes which fish live together in the wild and how to make an environment to match. A basic filter/pump/heater setup and you should be good to go. I like cichlids with rocks. But goldfish are really cool, too. 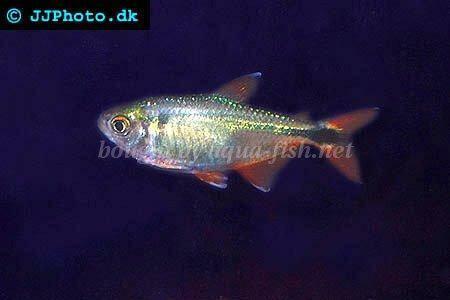 And/or a tank chock full of neon tetras with lots of vegetation. My wife was REALLY upset when I explained they weren't "cuddlefish." like Oderus would let you have his. I cheated, I bought the water at the Local fish/aquarium store.